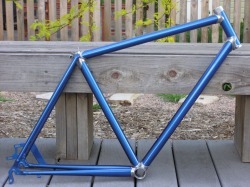 Don't Buy a Frame or Fork, Build Them! When someone buys something, they are acting merely as a consumer. Trying to define oneself through consumerism results in a rather empty existence for all but the most shallow. On the other hand, when someone successfully builds something, the experience is very rewarding. Rather than just "having good taste" or "being able to find a good bargain," the builder can take credit as a "craftsman" or an "artist." Unfortunately, recent mainstream bicycle media is pushing the fan of the bicycle toward shameless consumerism. The pages of bicycle magazines are littered with ads for gas guzzling SUVs, and articles advise readers not to bother purchasing tires that cost less than $70. A few years ago, one magazine even encourage the reader to put down whole foods such as bananas to make room for $3 energy bars. 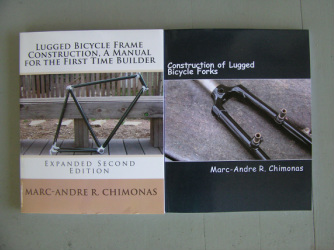 The books Lugged Bicycle Frame Construction: A Manual For The First Time Builder and Construction of Lugged Bicycle Forks are the author's attempts to bring amateur frame and fork building away from the margins so that craftsmanship and art replace consumerism as Bicycle Culture's mainstream. Prospective frame and fork builders are often intimidated by the cost of tools and equipment, and feel that the hobby of frame and fork building is out of their financial reach. Not to worry, Lugged Bicycle Frame Construction: A Manual For the First Time Builder simplifies the frame building process and explains how to build a quality frame with simple inexpensive tools such as a $35 MAPP-air torch, a hacksaw, and a rotary tool. Expensive jigs and alignment tables are not necessary. Construction of Lugged Bicycle Forks describes how to set up improved fixtures and oxy-fuel torches without breaking the bank. Most of the tools required to build the frames and forks described in these two manuals have applications beyond frame and fork building and can be used later on by the builder for routine household repairs. Content of Lugged Bicycle Frame Construction includes: road bikes, touring bikes, commuting bikes, cross bikes, mountain bikes, qualitative and quantitative bicycle design, and more. The book describes how to build frames for 26" wheels, 27" wheels, 700c wheels, 650c wheels, and 650b wheels. Jigging in this manual is rudimentary, and only inexpensive MAPP-air torches are described. 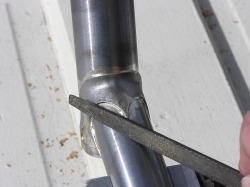 Content of Construction of Lugged Bicycle Forks includes: principals of lugged fork design, the use of oxy-fuel torches such as oxy-acetylene and oxy-propane, improved jig and fixture design, and brazing technique.